The New Zealand Baker - secrets and recipes from the professionals is a response to the interest of both home cooks and chef bakers who want to extend their baking skills and learn from the experts. This comprehensive book includes technical detail and advice plus favourite recipes from bakeries, restaurants and delis. This wonderful collection includes new and innovative, as well as traditional styles of baking – everything from leaven bread to croissants or honey and almond tart. 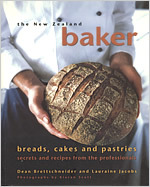 The bakery section presents recipes from about 20 of New Zealand's best bakeries. Winner of the prestigious 'golden ladle' for the 'best soft cover recipe book' at the World Food Media Awards in Australia, 2001. 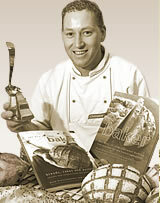 Winner of the 'best photography award' at the World Cook Book Awards in Perigueux, France, 2000. Peter Gordon, expatriate Kiwi and partner in the Providores Restaurant and Tapas Bar in London, author of The Sugar Club Cookbook and Cook with Peter Gordon at Home. Tamara Rubanowski, editor Essentially Food magazine. Flo Braker, author of The Simple Art of Perfect baking and Sweet Miniatures. Sylvia Macdonald, editor British Baker magazine in England. 'Brettschneider has built a career on breads, cakes and pastries, a fast moving career he's constantly extending. Even his car sports the registration number plate 'NZBAKR'. The New Zealand Baker was book of the week and received a very favourable review on Leighton Smith's high rating morning show on Auckland radio station Newstalk ZB.